The only downside? They aren’t as rare as diamonds with an IF or VVS clarity grade either. These are the diamonds that you will find at the fine independent jewelry store. But there’s one more drawback about VS1 diamonds that we also have to mention: they are more expensive than VS2 clarity diamonds that also don't have inclusions you can see with the naked eye. In most cases, the difference isn’t worth it. When grading a diamond’s clarity, graders examine the diamond under 10x magnification and determine the number, size, relief, nature, and position of inclusions and evaluate how they affect the overall appearance and durability of the diamond. Number of inclusions is important because the more inclusions there are in a diamond, the more they affect its overall appearance. The size of the inclusion is important because the bigger the inclusion, the more likely you are to see it. Relief refers to the contrast between the inclusion and the background, which affects how noticeable the inclusion is. Black inclusions are much more noticeable than larger transparent or white inclusions. The nature of the inclusion is a description of the inclusion. Types of inclusions include pinpoints, clouds, crystals, needles, knots, feathers, cleavages, internal grain lines, twinning. Types of surface blemishes include polish lines, scratches, naturals, indented naturals, cavities, chips, and bearding. The clarity grade of a diamond will be much lower when there are several different kinds of clarity characteristics. The location of inclusions is one of the most important clarity factors. Diamonds with inclusions in the center of the table will receive a lower clarity grade. Diamonds near the pavilion can reflect like a hall of mirrors so you see a single inclusion more than once. Inclusions near the girdle can be hidden by prongs, making them difficult to see when the diamond is set. Diamonds that are graded VS1 have minor inclusions that range from difficult to somewhat easy to see for a skilled grader using 10x magnification. 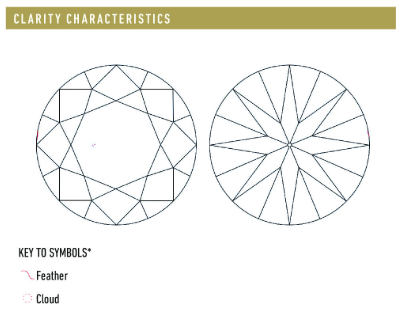 You will see a combination of features like feathers, naturals, pinpoints, clouds, needles and crystals. You will not see high relief inclusions in the center of the diamond or inclusions that cause durability issues. In the VS1 clarity diamond on the left, a tiny inclusion near the center is almost impossible to see. In the VS1 clarity diamond on the right, a cavity on the girdle might be prone to chipping. ROSI would eliminate the diamond on the right. But it’s important to point out that neither of these diamonds have eye-visible inclusions: you can’t see the inclusions in a VS1 diamond with your naked eye. It’s hard to find an example of a VS1 diamond where you can even see the inclusions in a large rotating video! And you definitely won’t see them when your VS1 diamond is set in an engagement ring. Is it worth it to pay the premium for a VS1 diamond? We don’t think investing in details that don’t make a difference to your diamond’s beauty is worth compromising other factors like cut quality or carat weight. Buying a diamond that has a lower quality grade but still no eye-visible inclusions will leave more money in your budget to buy a larger, more beautifully cut diamond. Should you pay extra for VS1 diamonds? In general, ROSI doesn’t think the tiny differences in appearance between the top grades of the GIA clarity grading scale are worth the investment. ROSI recommends buying diamonds without inclusions that are visible to the naked eye. Generally that means diamonds with a clarity grade of VS2 and above. But ROSI often does recommend VS1 diamonds for step cuts like emerald cuts and Asscher cuts that have broad facets that show inclusions more easily. 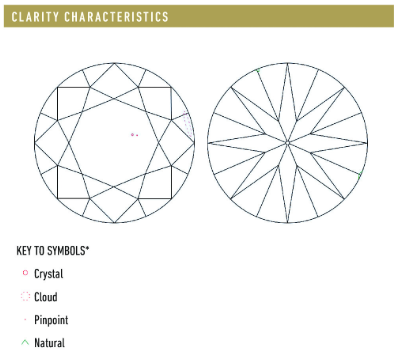 You also may want to upgrade to a VS1 clarity if your diamond is larger than two carats, because inclusions are judged proportional to diamond size: it’s easier to see the inclusions in larger diamonds. ROSI automatically takes these factors into account when searching for a diamond with the best possible combination of quality and value.